Step 1 – Get watercolour sketchbook. 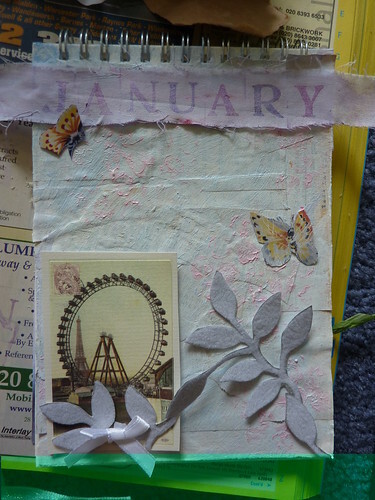 Glue together two pages with gel medium. 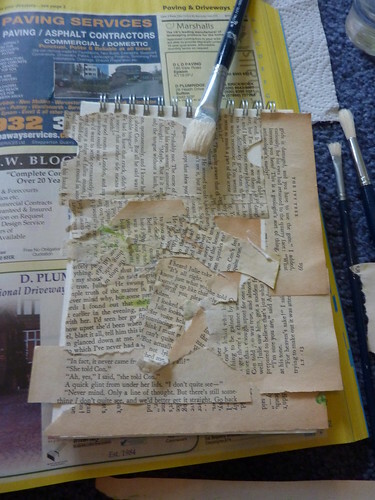 Step 2 – Glue on ripped pages from old book randomly. 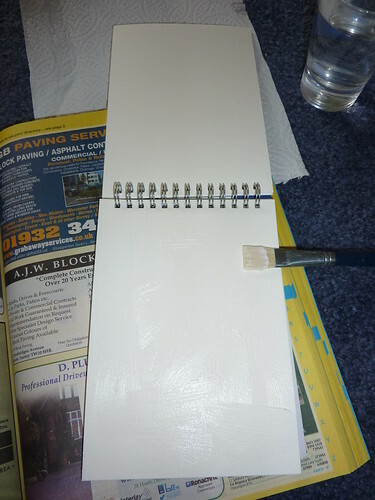 Step 3 – Paint over with gesso and let dry. Sandpaper a bit. 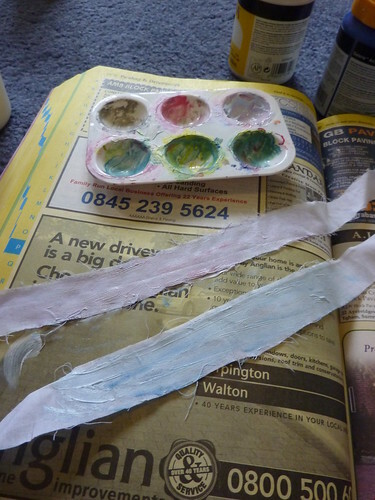 Step 4 – Paint some scraps of fabric with acrylic paints. 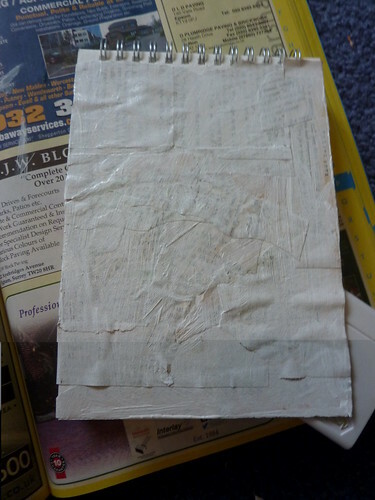 Step 5 – Paint page with acrylics. Paint onto a bit of bubble wrap with co-ordinating colours. Stamp onto page randomly. 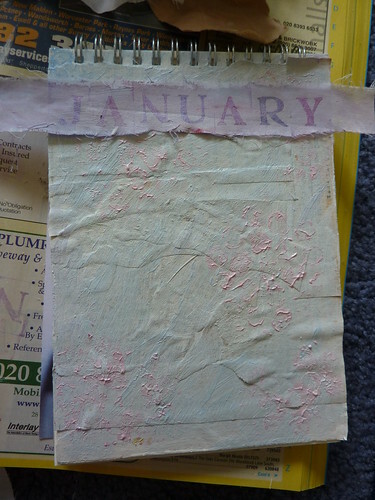 Step 6 – Stamp JANUARY onto the scrap of fabric. I used an ink pad called Brilliance in Twilight colour. Step 7 – Get various bits and bobs and try them out in different positions. 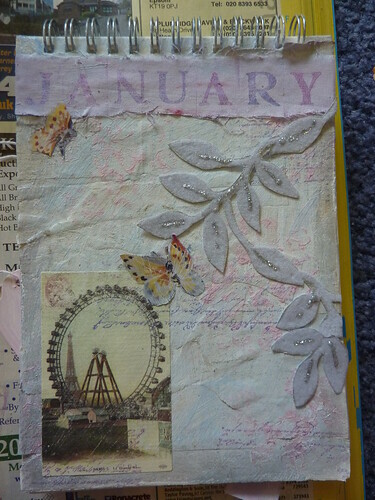 Sandpaper the sticker and butterflies to make them more distressed. I cut out the leaf form from a bit of paper – the leaves are a bit fuzzy, like felt. 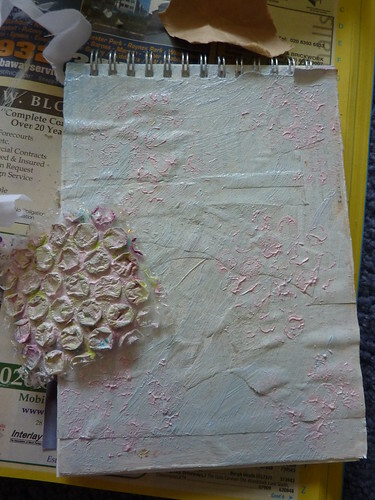 Step 8 – Stamp randomly over page with script rubber stamp (same ink as before). Smudge the edges of the page with silver drawing ink. Glue down fabric. Glue down other items. Put silver glitter glue onto leaves for added interest. This will be an ongoing project so is not totally finished. Hopefully I’ll try to post more as I go along.